Today has made me feel really ready for autumn – a long wet dog walk followed by some steaming tomato soup to warm up! This was followed by an afternoon of clearing out the baking cupboard, which turned up an abundance of nuts that needing using up. So using a recipe from the BBC GoodFood magazine, and adapting it to what was in the kitchen cupboards, here’s a nice seasonal cake that packs a punch of autumn-y flavours. I have two things to apologise for. 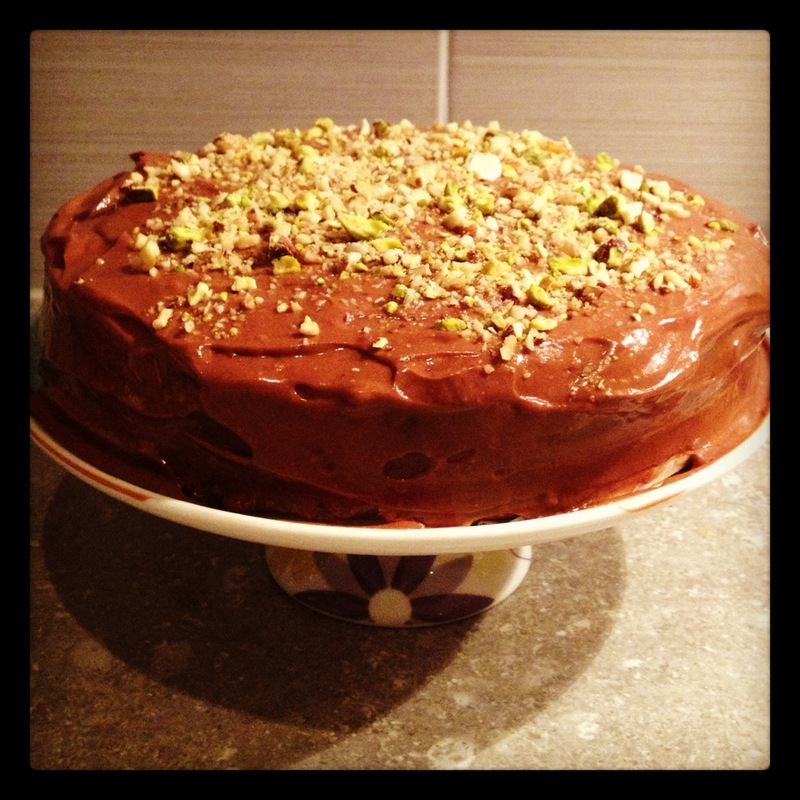 Firstly, although this cake is lovely and moist and will keep for a few days because of all the nuts, it does have rather a lot of ingredients though so you will need to be prepared! Secondly, I discovered Instagram this week (behind the times I know!) so the blog is getting even more retro! INGREDIENTS: 250g melted butter, 250g caster sugar, 100g self raising flour, 50g plain flour, 100g ground almonds, 1tsp baking powder, 2tsp mixed spice, 1tsp ground cinnamon, 1/2 tsp ground nutmeg, 200g mixed chop nuts (I used 50g each of walnuts, hazelnuts, almonds and pistachios all whizzed up in the food processor), 100g chopped dark chocolate or chocolate chips, 3 large eggs, 1tsp almond extract, a tin of pears, butterscotch chips (optional). Heat the oven to 160 (fan oven) and butter and line a 23cm loose based cake tin (this is really important because this is a slow bake and will burn at the edges without lining the tin). Mix the sugar, flours, ground almonds, baking powder and spices in a bowl, then add in most of the nuts (leave a few tablespoons aside for topping the cake later) and the chopped chocolate. In another bowl, whisk the eggs, almond extract and melted butter until it thickens and foams. 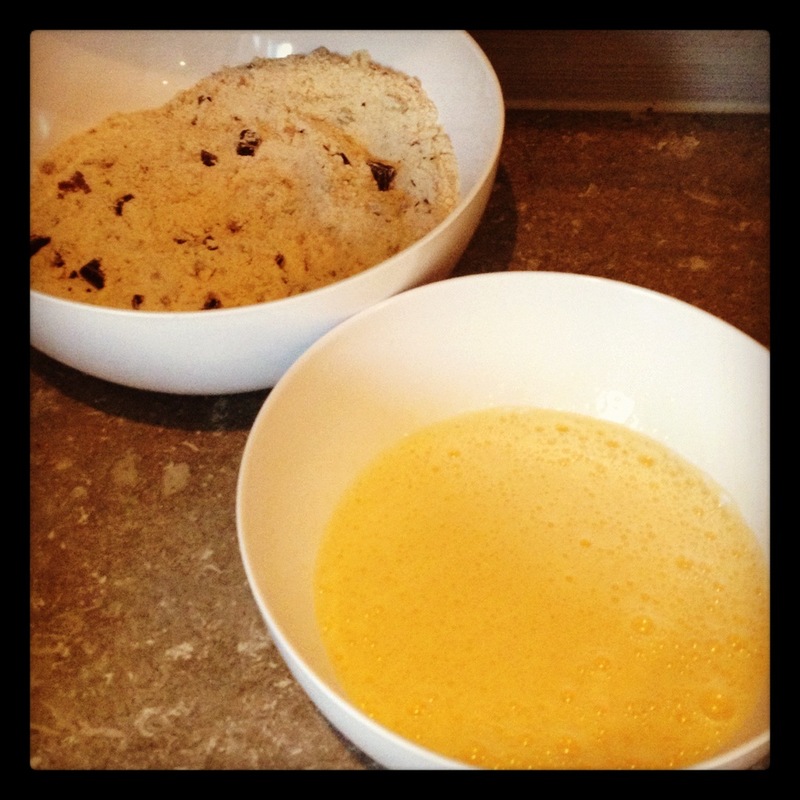 Wet and dry ingredients in two bowls – ready for some mixing! Tip the wet ingredients into the dry and stir together. At this point I got a bit excited about all the things that could go into this cake and threw in a handful of butterscotch chips, but these are an added extra only and not vital. 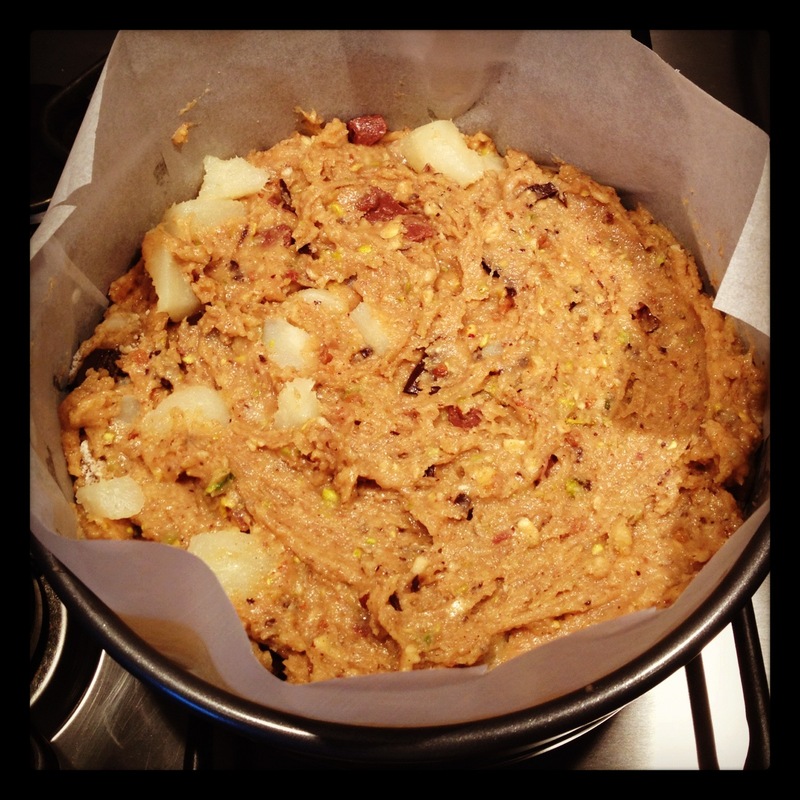 Chop the pears into chunks and fold through the cake mixture. 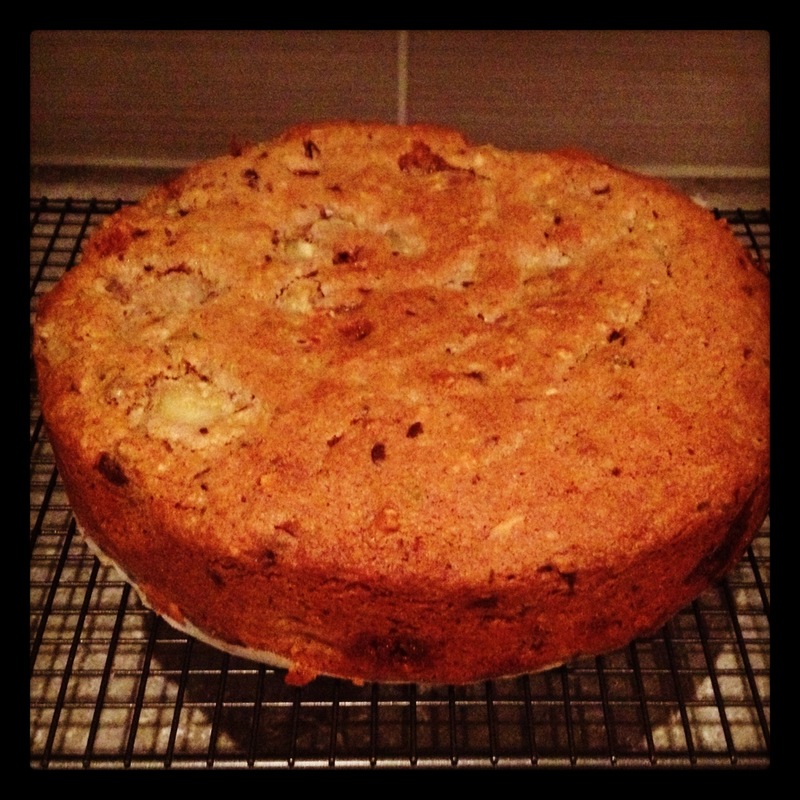 You can use fresh pears if you want, but the ones in the tin are very soft and add a good moist texture to the cake. So if you are going to use fresh pears, make sure they are really ripe. Pop the mixture into a tin and bake for 45 minutes. Then cover the tin with tinfoil and bake for another 30 minutes. Take out the oven, leave to cool for 5 minutes in the tin and then turn out onto a rack. It should look golden but not too coloured…. Lovely and golden – cooled and ready for icing! Once its cooled, you’re ready for icing. 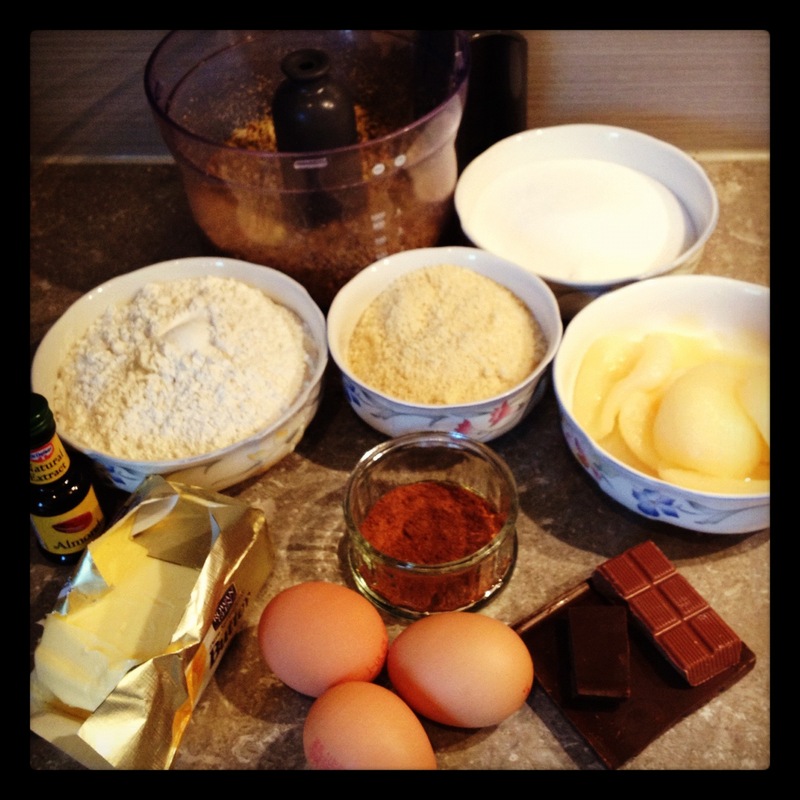 INGREDIENTS: You’ll need 200g chocolate (I used 150g milk and 50g dark), a 300ml pot of sour cream and the leftover nuts. Melt the chocolate slowly – I did it in bursts in the microwave but you can do it in a bowl over a pan of water if you prefer. Mix the sour cream into the chocolate and beat until smooth. Then pop the bowl of icing into the fridge until it thickens up enough to spread without flying everywhere. I was too impatient so my icing was a little runny. You could even leave it in the fridge overnight and spread it the next day. Once iced, just sprinkle with the remaining nuts, et voila! The finished product! Rich and full of flavour. As well as being a great teatime treat, this would make a great dessert. 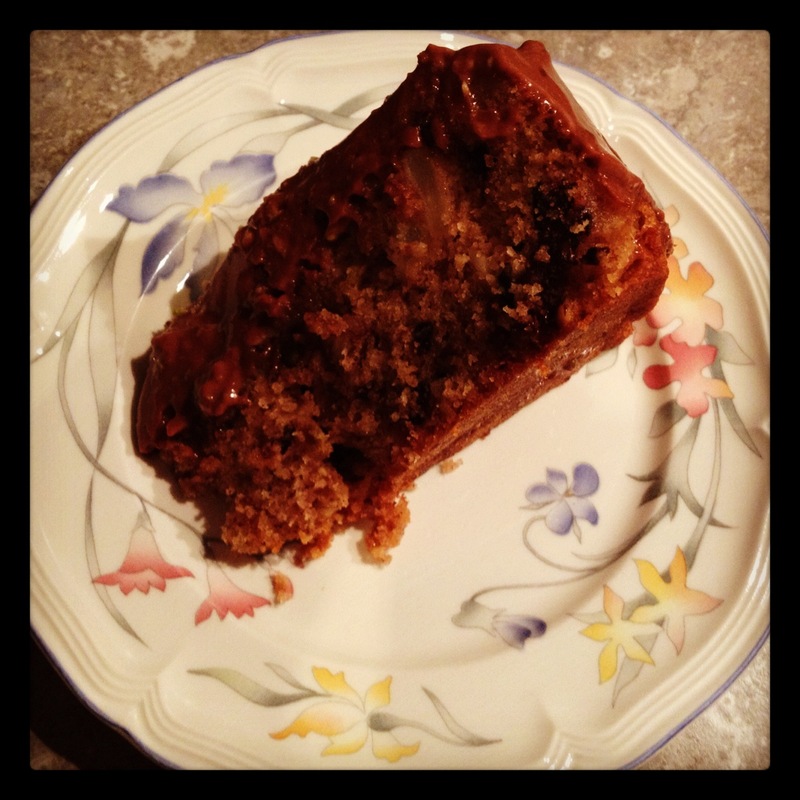 In fact, that’s what we had for pudding this evening – still warm with runny icing and a blob of natural yoghurt…. So rather than being sad at the passing of summer (did it even make an appearance?! ), let us celebrate the start of autumn!